We had a fabulous Easter day together. 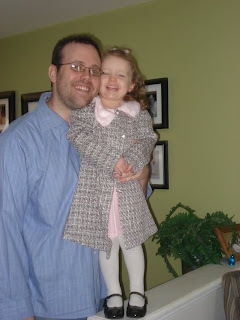 MJ wore her beautiful new Easter dress and coat...Thanks Mommom and Pappy for this. We were able to all go to church together and reflect on the amazing gift of life that Jesus provided through his death and resurrection. 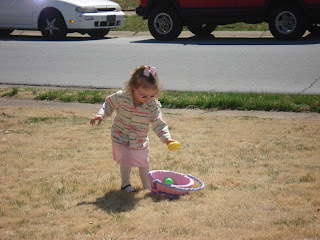 Then, we headed back to our house for a family Easter Egg Hunt...MJ did all the searching for eggs. She was such a nice girl to share her candy with Mommy, Daddy, Pappy, and Mommom. Later, we went to Mommom and Pappy's house to have dinner with them, plus Aunt Judy and Aunt Janet. We really enjoyed the entire day. Thanks Mommom and Pappy for all of our Easter presents...we love them. You guys are AWESOME. I love the sweet pictures. Michaela looks so Easter pretty! What beautiful weather in Wilmington. We are just beginning to see a little lawn here and there. Next year Easter is April 24th. It will be nice here by then...I am hoping. You are such a cute family. Come out, come out where ever you are little sweetie baby M. We can't wait! What a nice Easter we had. Michaela you are sweeter than any candy that the Easter bunny left. I love you and your Mommy and Daddy too. 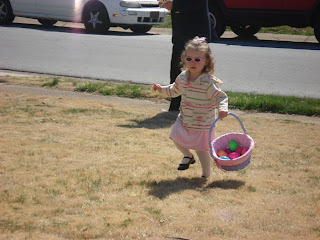 Sweet MJ, you look absolutely adorable in your Easter dress and I love your sunglasses! I was hoping the Easter Bunny would leave your new baby sister on your doorstep but candy is good, too! Suddenly, you look very big, MJ! 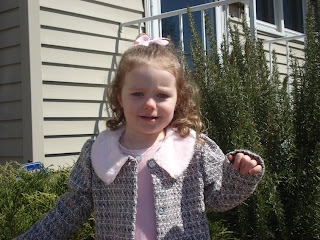 Michaela, you look soooo cute in your Easter outfit and coat. I hope you found lots of eggs on your egg hunt! Happy Easter Ousdahl family! These are darling photos...as usual. Next Easter there will be two beautiful little girls (plus Melissa!). We'll have our grandbaby then too..(a boy) and can't wait to share so many precious moments and holidays with him. 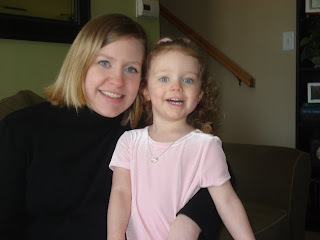 Just seeing your blog shows all the joy that little ones bring to everyones lives.